general » Does Brexit Spell The End of Comparative Advantage? Germany and Britain have knit close ties as part of global production networks. However, Brexit makes trade more costly – and impacts the design of production chains. 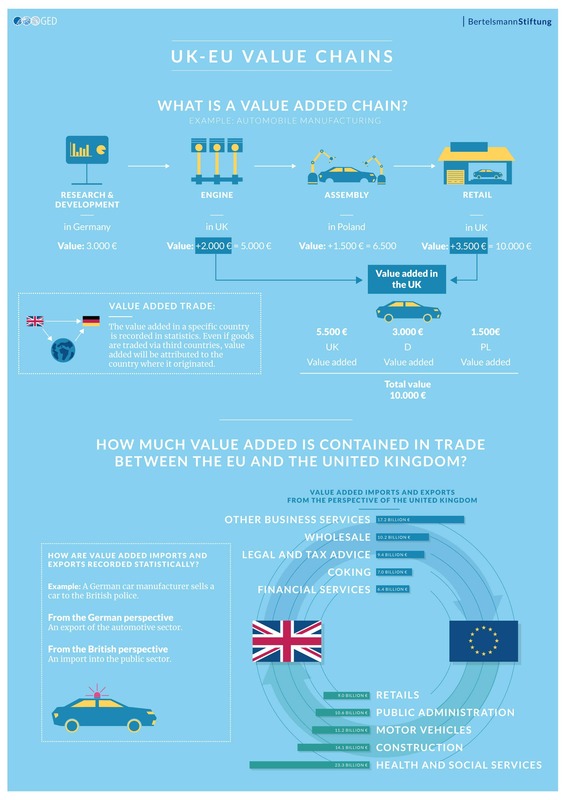 In this new study, we look into the close ties in value-added trade between British and German sectors and analyze to what extent they will be impacted by Brexit. Germany and the UK are close trading partners. For the UK, Germany is the second most important export market (after the USA), while the UK is the fourth most important export market for Germany. Germany buys goods and services worth 115 billion euros from Great Britain, while Great Britain buys 70 billion goods and services from Germany. Brexit will inevitably lead to an increase in costs of trade. What is value-added trade and why is trading with added value important? Value-added refers to the additional value created by a production step. The sum of the value-added of all production steps is equal to the final value of the product. The value created in a specific country as part of an international production chain can be measured. It is also possible to measure the value-added content in imports and exports of intermediates between different countries. These exports and imports are also referred to as trade in “value-added” or value-added trade. Intermediate trade merely captures the final value-added step and additionally assigns all value-added contributions of previous steps to the supplier of intermediates. In an international comparison, countries with a low value-added share of trade are typically countries where simple assembly of intermediate products is carried out. How would Brexit impact the value-added chains? Complex production chains involve highly specialized activities by manufacturers and service providers. In the automotive sector, for example, it is common for intermediate goods to be shipped back and forth between different production sites on the continent and in Britain until they are assembled into a final product. The precise impact of Brexit depends on the future trade regime. As we have showed in an earlier study, it ranges from the tolerable to disastrous. If the UK remains in a customs union, there will still be conformity checks at the border – but at least there will not be any tariffs as in a WTO scenario. Whatever the scenario, trade will become more costly. As a result, producers need to decide whether to pass on the additional costs of maintaining their existing production networks to their consumers or find new production partners with whom they can continue to produce at a cheaper price than with their former British partners. Which German sectors are (in absolute terms) most active in value-added trade with the United Kingdom? 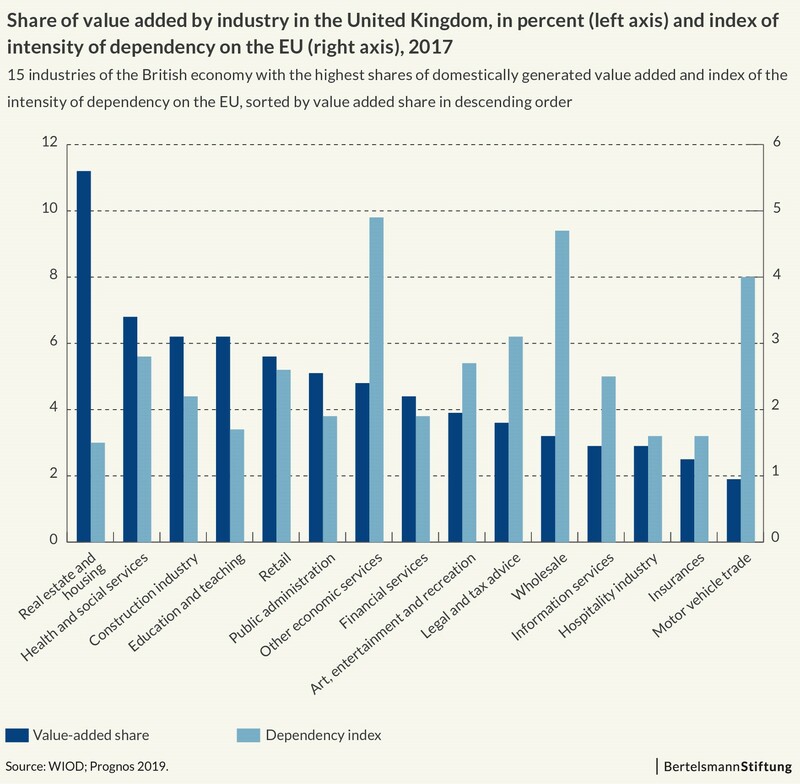 Which British sectors are (in absolute terms) most active in value-added trade with Germany? For the United Kingdom, the most important export sectors of value-added into Germany are wholesale trade (2.9 billion), legal and tax consultancy (2.9 billion), business services (2.8 billion), mining (2.7 billion) and financial services (1.9 billion). The most important import sectors of value added from Germany are healthcare (10.1 billion), automotive (5 billion), construction (4.7 billion) and public administration (3.8 billion). In relative terms, chemistry, metal work, mining and the automotive industry show the highest degree of dependency on the German economy. What does Brexit mean for value-added trade between the United Kingdom and the EU and Germany? 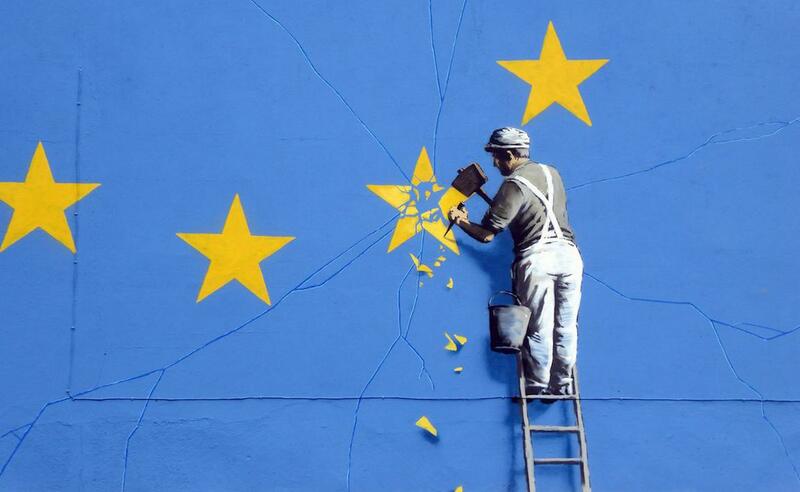 For the United Kingdom Brexit will change trade relations not only with Germany but the entire EU. The level of value-added contributions from the EU in British products is much higher than the content of German value added in British goods. Similarly, the demand for British value- added and final products from the EU is substantial. This implies a much higher need of adjustment as you can see in the two figures below. 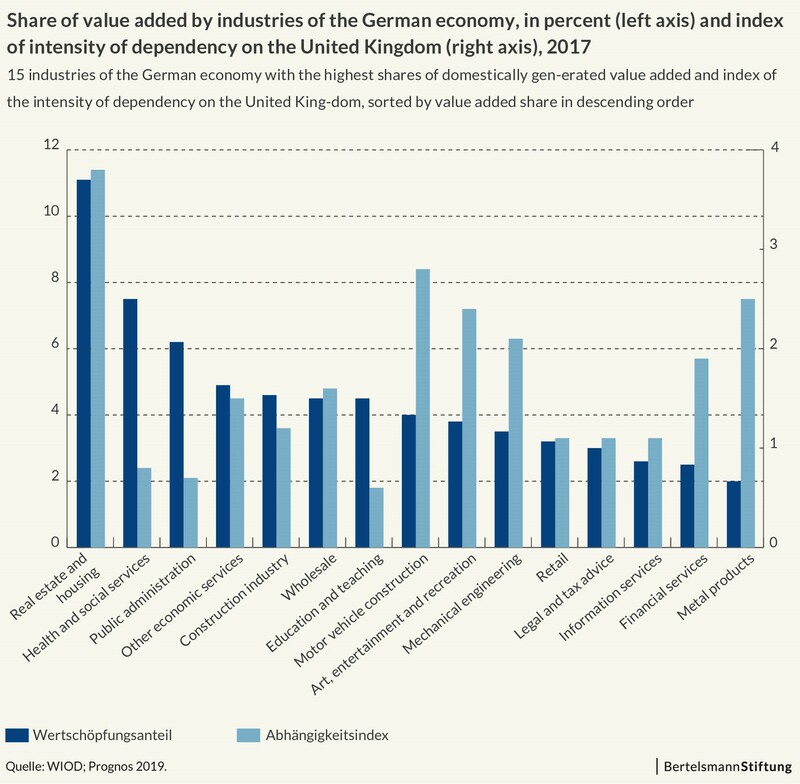 The first compares the importance of certain sectors for the German economy with their exposure to British production chains. The second does the same thing for Britain, i.e. the relevance of sectors for the economy as a whole as compared with the extent to which they engage in value-added trade with the remainder of the EU. As you can see, the levels are much higher in the case of Britain, pointing at a painful adjustment process post-Brexit.